Fall is definitely on the brain this week. This inspiration board has a cozy and romantic vibe to it, perfect to incorporate into those chilly fall nights. I love the scarves as favors for snuggling, such a sweet offering to guests. The image of the white Mr. & Mrs. pumpkins is cute, and sets a cozy tone to the decor of the venue. The image of the flowers and pumpkins is a perfect way to find a fall color palette, and shows a cute way to decorate the table setting. I am swooning a little bit over the sugared hay cake, with the tiny pumpkins on top! Sugared hay is a genius way to add rustic touches to desserts, and this image shows this perfectly. I also love the image of the "wheat" boutonniere, very unique indeed-a no fuss for the guys! 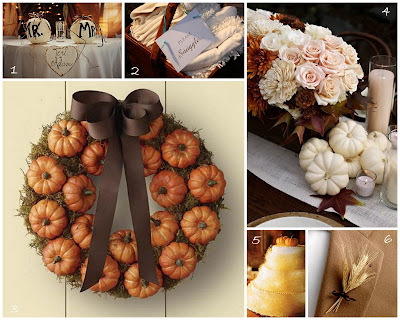 I hope you enjoyed this simple yet romantic inspiration board! Happy planning, you never know what will inspire you! You should head up north, it is already getting chilly and I am LOVING IT! I actually busted out a sweater this past weekend, not really necessary but it was cool enough to actually put it on so I went for it! I love Fall - I'm so ready for it down here in Atlanta! Great inspiration board - I'm loving the scarf idea too! I totally need to move up north!! I miss the seasons in the mountains!